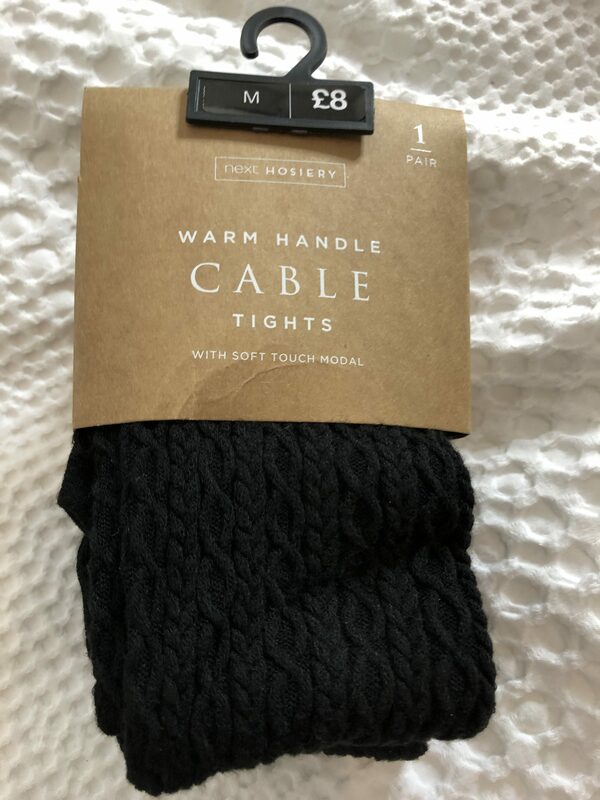 First up my cable knitted tights had a ladder in so I needed to buy some more. I am fussy with my style, so I am really hard to buy for. To be fair tights should be something easy to buy me but I get cold easily, so they have to be the right thickness. I found these in Next and I tend to wear with dresses and pinafores for any occasion really. They are a good buy because they can go with most things and add a little something to a plain outfit. As I mentioned earlier I am one to wear once and pass on. I definitely don’t like to wear things more than once if I am going out on the town. Weird and expensive I know but even if I had a tracksuit and top knot I would still try my best to look my best. The way I look and feel, is to be stylish. 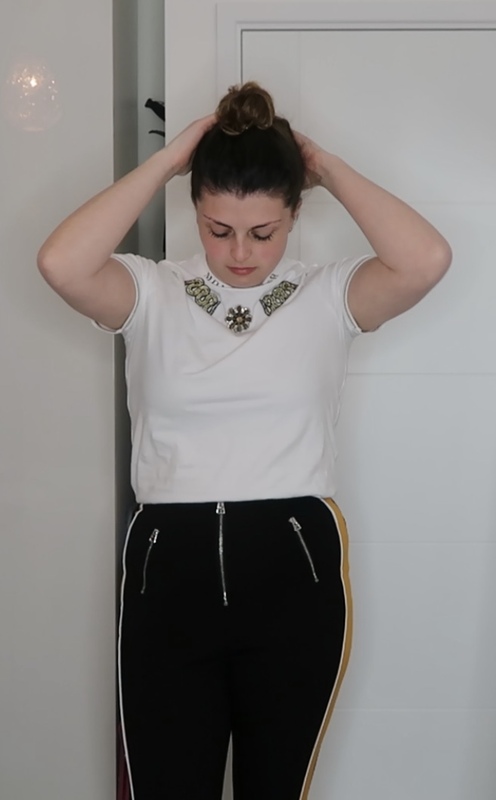 Ok sometimes for work it’s hard to be stylish etc but if I am just going out with friends or out out then I would 100% buy something new to wear. That brings me onto what I brought next. I was going out for the evening. So of course, a new outfit. Trousers are hard for me for my stomach and condition. However, I do love trendy pants. I do try my best to try and see if they are comfortable for my tummy. This is where I became lucky. 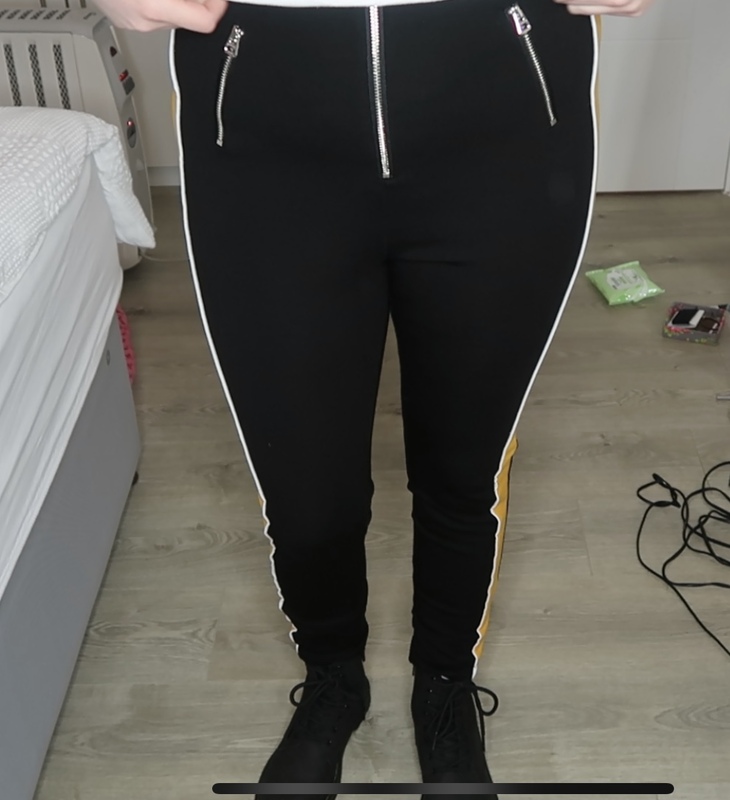 I found these trousers in River Island. They are leggings as such so they stretch where I need them too. 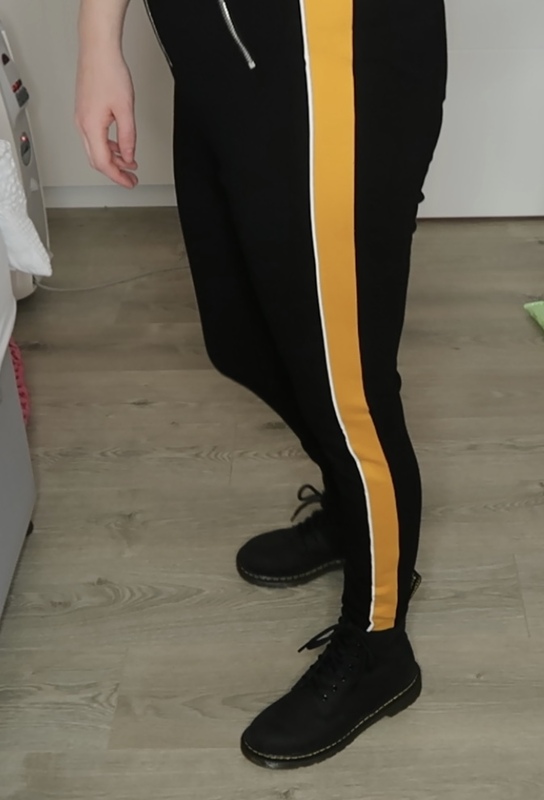 I love how they are plain black with the silver zips to look at but if you look at them from the sides, you see the stripe of Yellow. Just adds something to the trousers and I love them with my Dr Martens. These were a good price too. I always find River Island expensive, but I would say these were cheap for trousers. To go with this, it was hard with what was in the shops to pair. The yellow makes it harder to find something to go with. So, I went with this white top with gold details. It’s something different to what I would normally go for. I am one for a plain tee or obvious print on it. So, this just have the gem detailing of snakes round the shoulders and the phrase ” mon amour” around the neck really helps it go with the trousers. This was slightly more than the trousers but is something I can wear often, chilled out weekends and ones with friends. 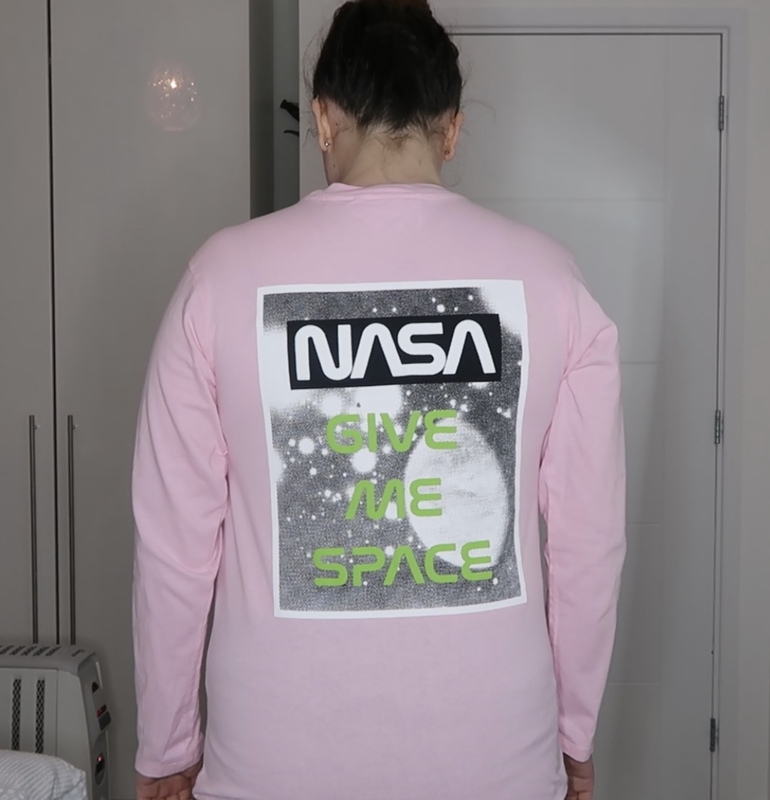 Nasa themed clothes are really on trend, something really easy to chuck on with jeans and trainers or a skirt even. 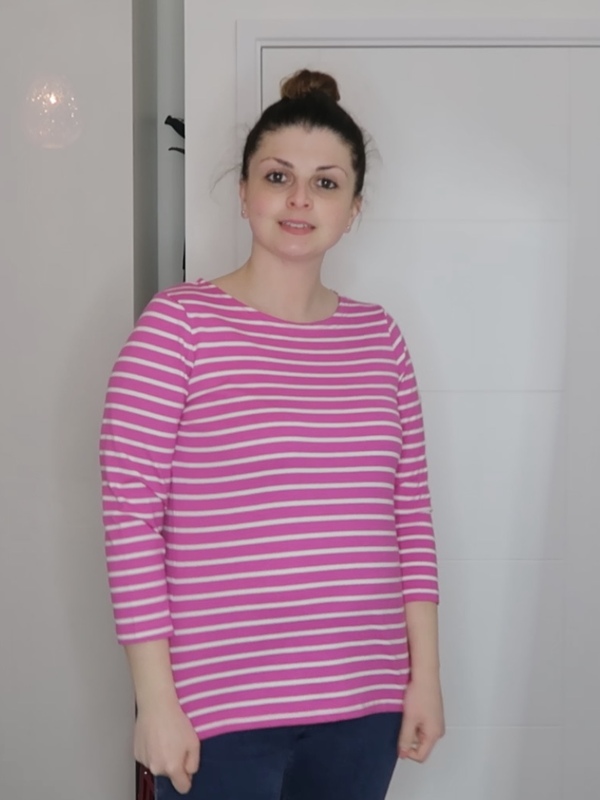 As the weather is getting warmer in the UK for spring I like to wear long sleeve tops but without jumpers. 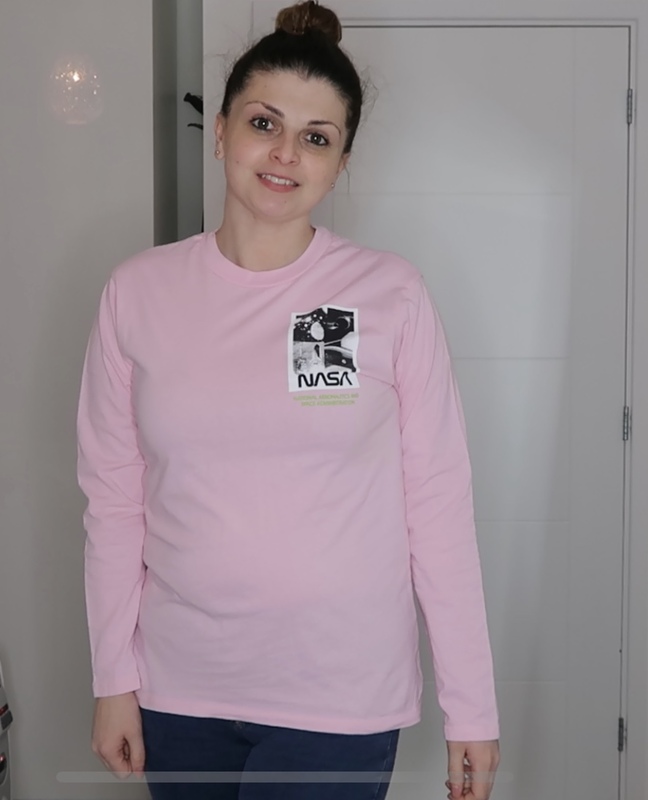 I love the NASA print and I love the brand Tee and Cake. When I saw this in Topshop I had to buy it. The baby pink with the green and white just looks good with Jeans. Even to chuck a jean jacket with, is good. 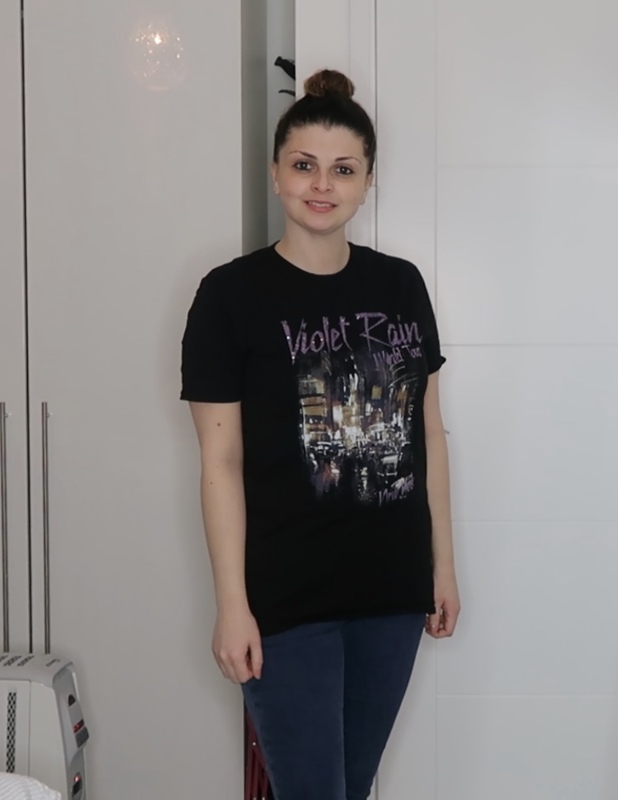 I have been able to wear this already as the weather is getting warmer but can’t wait to wear this more often this Spring. Whilst in River Island again I can’t wait to not be wearing jumpers all the time. When I found this, it reminded me of a band style top. You know ones like the ACDC tops. I loved the hint of purple in it. Again, it’s one for chucking on with jeans or with plain fancy trousers. It’s something basic that you can dress up or down. Or just look stylish with some converse or vans and jeans. 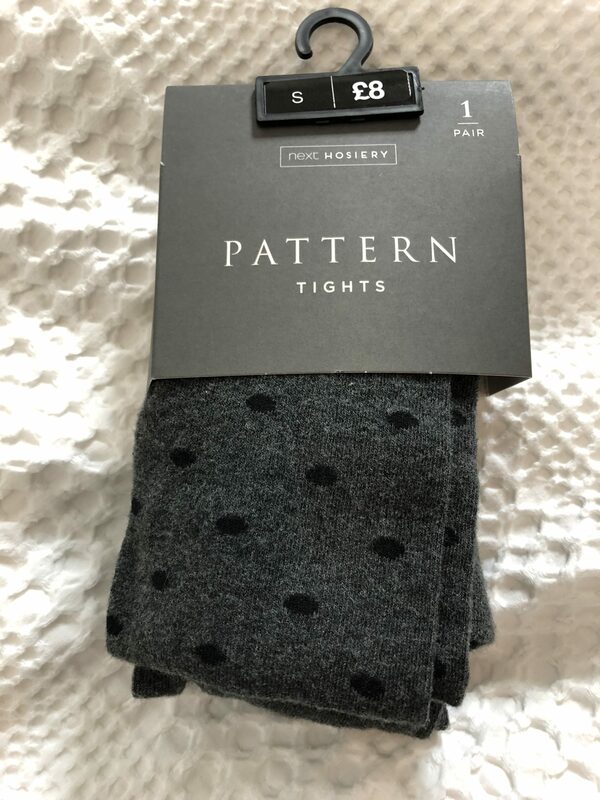 When I was looking for tights in Next I fell in love with these grey polka dot tights. They remind me of children’s tights, but polka dots are really on trend. Them and stripes really. As much as you would think stripes and spots shouldn’t be warn together, actually if paired correctly they go really well together. These tights I thought would look super cute with pinafores. Pinafores and tights are a go to outfit for me. Something comfy, stylish and like you have made an effort. Again, if you have a plain pinafore on and plain tee, it just adds a little fun to the outfit. Imagine walking along and 5 people have plain tights and 1 has spotty. These are the ones that will stand out. Wear them well and you will really look amazing and on trend or starting one. Then I go onto and when writing this I realise I have brought the same top twice in the same month. Just a different colour. But never mind. 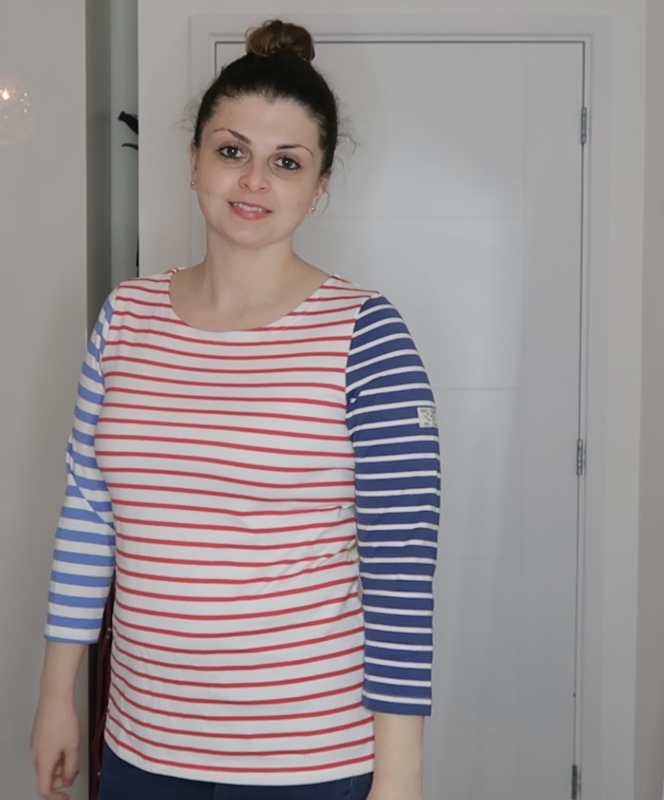 Anyone who knows me well, will know pretty much half of my wardrobe contains stripe clothes. I love a stripe. 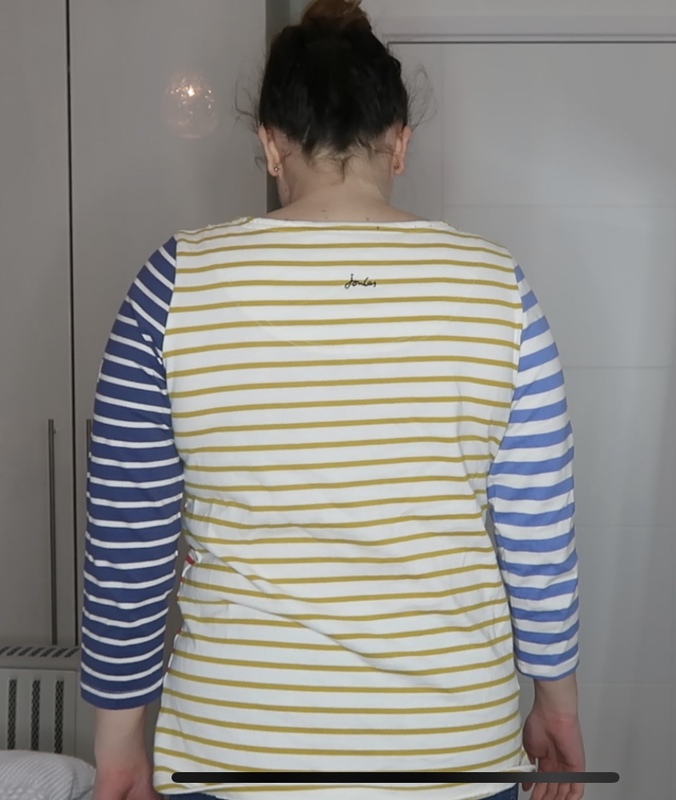 These joules tops are a little thicker and well made. I actually have this in grey and white already. When I saw this one I had to buy it. It shouted fun at me because of all the shades and colours. Again, it adding something to a plain outfit. Its red, yellow, a purple kind of blue and navy blue stripes based on a white top. Perfect for spring as well because of the three-quarter length sleeves. The thicker material helps too. Well for me anyway the one who feels the cold! I can’t wait to wear this with pinafores, dungarees and even jeans. Works with most things. Then I don’t really know why but I have a vision in my head, I have grey denim fabric to make a pinafore for myself. But I want to be able to wear it with pink vans and a pink stripe tee. Pink and grey really go well together and I can’t wait to have the finished look. Just need to make the pinafore now. Vans are for my birthday. Again, I can wear this with pinafores, dungarees and jeans, even with a skirt possibly. I just love how bright the pink is. Pink is actually one of my favourite colours, yet a colour I don’t have many clothes in. I need to add more to my wardrobe. Finally, I brought this way out of there top that one I wouldn’t normally go for. But as you may have already seen from this month’s buys. I am right into colours at the moment. Again, typical me it’s to go with jeans, pinafores and dungarees. But it’s fun. I love Vans as brand, shoes and clothes. I had to buy this as soon as I saw this because it was going to sell out. Which it has now. 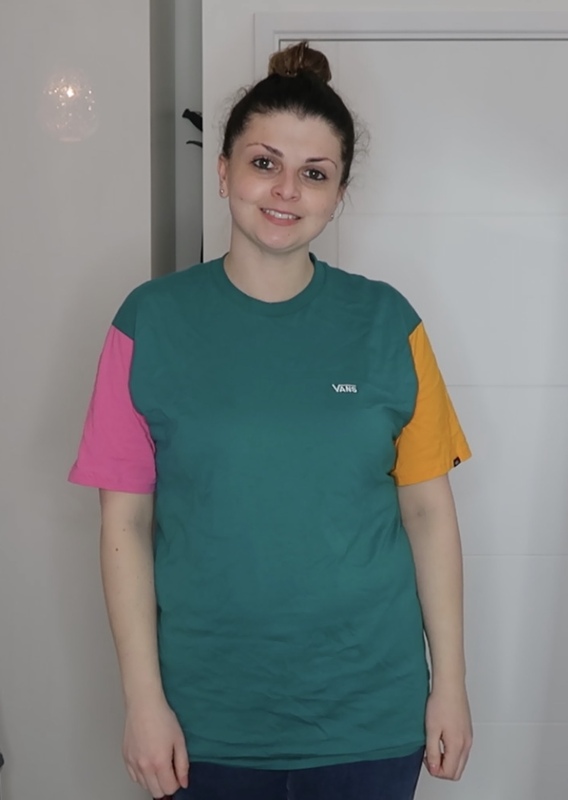 It’s teal in colour on the main body with one sleeve in yellow and the other in bright pink. I wore this with jeans at the weekend and it was just bright and cheerful. I can’t wait to wear this more in spring and into summer. 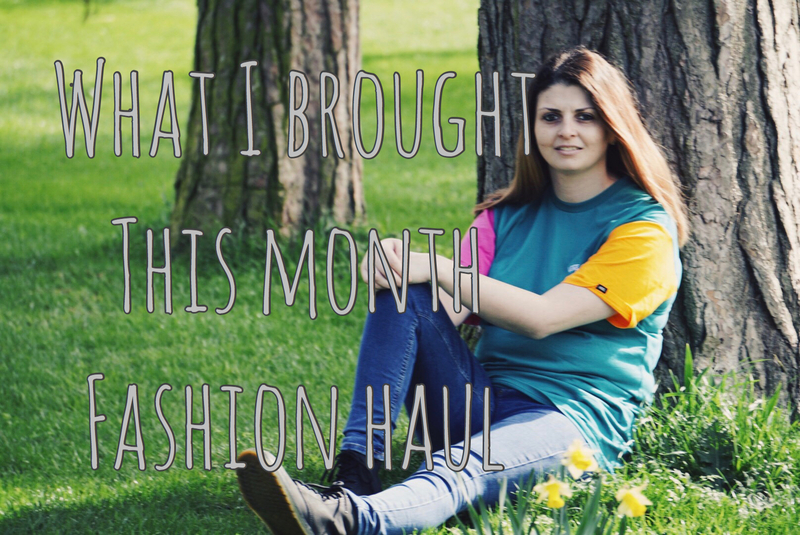 What have you brought this month? Are you one for the latest trends, setting trends or following them? Or does fashion not really bother you and you do your own thing? What out of these would you buy?